For those out to see places of worship, Medak is a necessity in the itinerary. An awe-inspiring Church that can accommodate about 5,000 people is considered among the best in the world. Just about 100 km from Hyderabad is the famous shrines with stained glass windows, that have won acclaim the world over. Started in 1914, the church took ten long years to complete. So imposing is the structure that the belfry stands 175 feet high. And that is not the only wonderful part. All over, there are stained glass windows depicting scenes fro the Bible. The window to the north is in the form of a canopy to the altar and is the of fantastic one depicting Jesus giving up the ghost. The birth of Jesus and his crucifixion are shown in the two other windows. The century-old church at Medak is one of the finest examples of Gothic architecture in the country. Medak is about 100 km from Hyderabad and being the second biggest town of the district has a number of buses plying between Hyderabad and the town. Medak Church: In the Medak town is the famous Cathedral built with love and crafted to perfection. As the legend goes this church was born out of a famine that struck Medak during World War I. This church took ten continuous years to complete this beautiful piece of architecture. With its massive dimensions the church can accommodate as many as 5000 people at a time, The remarkable stained glass work on the huge windows of the church offers a spectacular view during the day time, which cannot be replicated by artificial lighting. 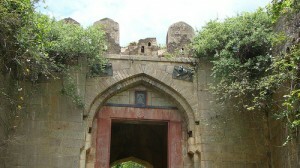 Medak Fort: More of an outpost of Telangana, Medak, earlier called Siddapur, has a citadel dating back to the Kakatiyas,. It was built during the reign of Kakatiya emperor Prataparudra. Strategically built on a hillock, it was called the Methukudurgam, from the telugu word Methuku-meaning cooked rich grain. The main entrance proudly displays the double-headed bird “Gandabherundam” of the Kakatiyas. Edupailu: 8 km from Medak at Edupailu is a temple dedicated to Goddess Kankadurga. According to the legend, Maharaja Parikshit (the grandson of Arjun) performed “Sarpa Yagya” to rid himself of a curse. When Garuda, the eagle, was transporting the snakes their blood is said to have fallen in seven places, which became streams. All of them meet here to form river Manjeera. This picturesque spot marks the confluences of seven rivulets into Manjeera River and hence the name Edupaiu. In Tellugu Edu are seven and Pailu is stream. Lakshmi Narasimha Swamy Temple: At Nacharam, or Nachagiri, earlier called Swetagiri is a centuries old temple dedicated to Lord Narasimha Swamy. Through ages, the temple has been a source of solace and pilgrimage. The temple of Sri Nachagiri Lakshmi Narasimha Swamy in Gajwel Mandal is 12 km from Medak and 40 km from Hyderabad on the Hyderabad – Nagpur highway. It is also called as Swetagiri or Gargeya Thapovanam. This temple is built on the banks of the sacred River Haridra. Pocharam Forest and Wild Life Sanctuary: Located 15 km from Medak and 115 km from Hyderabad, this sanctuary can be reached by private transport from Medak. Pocharam Forest was the favourite hunting ground of the Nizam and he declared it as a wild life sanctuary in the early part of 20th century. Named after the Pocharam lake formed form bunding of the Allair in the year 1916-1922, it is spread over 9.12 sq. km. Koti Lingeshwara Swamy Temple: Koti Lingeshwara Swamy Temple is situated at Siddipet, is 45 km from Medak. There is a small check-dam near the temple, where people and pilgrims who visit this temple can enjoy scenic view and boat rides. Nandi Kandi: Nandi or Nandi Kandi is a, small village located 15 km from Sangareddy and 60 km from Medak. The temple known locally as the Rameshwara or the Ramalingeshwara Temple is a unique star shaped temple of the Kalyana Chalukyan period. The four exquisitely sculptured pillars in the centre of the hall depict the figures of the Hindu deities Bramha, Vishnu, Shiva, Narasimha, Varaha, Nartaraja, Devi Mahishasur Mardini, Devi Saraswati and Gaja Lakshmi in various forms. There are also sculptures depicting Dikapalakas, Apsaras, Rakshasas, Matrumurti and Darpan Warriors etc. Kondapur Museum: Located 15 km from Sangareddy and 60 km from Medak the excavations at Kondapur have brought to light the remains of Satavahana dynasty and a few Buddhist structures the Kondapur Museum is maintained by the Archeological Survey of India. Kondapur is Mandal head quarters; and is located 69 km from Hyderabad. The Kondapur Museum contains about 8,100 antiquities at present. Sri Kasi Vishweshwara Temple: 4 km from Sangareddy, 71 km from Medak near the Manjeera Barrage is Kalabgoor village where the Sri Kasi Vishweshwara Temple is situated. This temple dates back to the time of the Kakatiya rule in 14th century AD. The architecture and construction of the Thousand Pillar Temple in Warangal is exactly similar. There are two other temples under one roof namely Anantapadmanabha Swamy Temple and Sri Venugopala Swamy Temple. These temples are quite beautiful and Pujas and Abhisheks take place regularly till today. Manjeera Forest: For the nature lovers Medak has places of immense beauty and interest. Neltling between Manjeera and singur barrages, the Manjira wild life sanctuary comprises of nine small islands, which are home to a number of resident and migratory birds in addition to Marsh Crocodiles and Muggar. Located 75 km from Medak and 5 km from Sangareddy, it is spread over 20 sq km. The average width of the sanctuary is 50 to 800 metres. Best season to visit is November to January. This entry was posted in Andhra Pradesh, Medak. Bookmark the permalink.